With winter break coming around, the holidays are one thing to get excited about, but also catching a break and getting a moment to relax is another thing that the winter break welcomes. Whether you've been crammed with finals and you're now able to kick back and get some much needed relaxation to refresh or you've been just itching to get an off day, your chance is just around the corner. However, one thing that also comes with the break is this huge amount of time to do anything. When we constantly feel the need to be productive and all of a sudden that just disappears, sometimes I find myself not knowing to do with all of this newfound free time. One of my favorite things to do with off time is to binge watch everything on Netflix that I had been putting off watching before. When I'm busy, I avoid Netflix so that I don't get too hooked on anything. So when break comes around, I'm finally free to indulge. Here are some things that I've enjoyed and hopefully you will too when indulging during this upcoming break. Rebecca Bunch previously lived in New York and worked at a prestigious law firm. However, she wasn't happy. When she ran into her ex, Josh Chan, from camp, she decided to follow him and move to West Covina, California in search of love and happiness. The series has a musical element, having songs in every episode in order to express Rebecca and the other characters' thoughts and mental states. I'll be honest, I wasn't that impressed with the show when it first came out. The idea was intriguing, but it wasn't something that I was crazy about (pun intended). However, upon watching it, I've become more and more hooked. The first season was all about Rebecca finding her place in West Covina and chasing after Josh. However, throughout the seasons, they continue developing Rebecca's mental state and understanding of it, which is really showing throughout season 3 (so far). I think that Crazy Ex-Girlfriend is worth watching because it's incredibly creative with all of the musical numbers, but it also does a fantastic job of addressing mental health and feminism. White collar criminal Neal Caffrey escapes from prison and then is caught by FBI agent Peter Burke, who was the one that initially put him there. However, instead of returning, Neal suggests that he become a consultant and help the FBI catch criminals, since he has the insight of understanding the way that they think. The series goes through many different crimes and the creatively unconventional ways that the two catch the criminals. White Collar has a new crime every week and I think that it's super interesting to see the different ways that Peter and Neal come up with to find and/or stop the criminal. There's always a little suspense and drama. Additionally, Neal has his own little mystery and his own vendetta that will keep you on your feet. After the murder of Jason Blossom, high schooler, the town of Riverdale is never the same as they see the dark side moving into the town. Riverdale is filled with the mystery of his murder, the secrets that the kids and parents have, the romances, and more. There's lots of intrigue and drama throughout the show that will definitely keep you on your feet. It has a little bit of Gossip Girl type drama but at the same time it has a Pretty Little Liars sense of suspense and mystery. Judges Mary Berry and Paul Hollywood create three challenges per week for 12 amateur bakers that compete to win. The show features all kinds of baked goodies as the bakers are tester for their technique, creative flair, skill, and talent. I love a good baking show and GBBO is no exception. I just started watching it and it's such a nice thing to watch if you're not looking for the suspense, intrigue, and drama that surrounds most of television. Not to say that GBBO doesn't have it sometimes, but it's completely different. It's interesting to see all of the fun creations that the bakers come up with and it's great for inspiration in your own baking adventures. Based off of the life of historical figure, Mary Stuart, Queen of Scotland, the show follows her life as she must work to maintain her crown, help her people, and protect herself in the process. With an initial strategic marriage agreement to the future King of France, Francis, Mary must learn to navigate French court. The show follows the drama, romance, mystery, and more that goes on in Mary's life. When I first started watching, I was completely hooked. Over time, I lost my interest, but then I quickly found myself hooked once more. Reign has a little bit of it all: a fascinating historical time period, a bit of fantasy and magical realism, romance, a little mystery, and lots of drama. 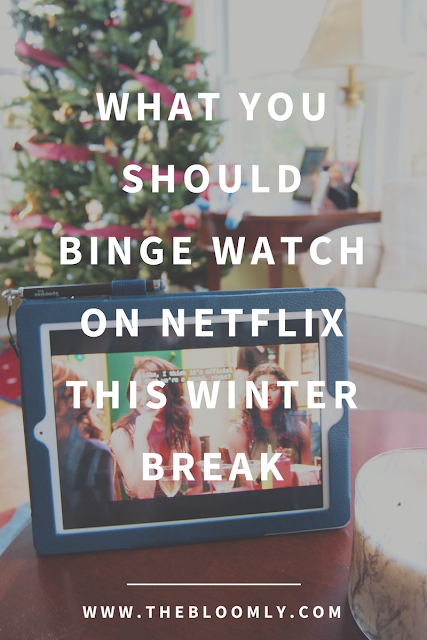 What will you be binge watching during this winter break?